The naked pin, defined by S32terminal as a voltmeter, can measure max. 3.2 to 3.3V. 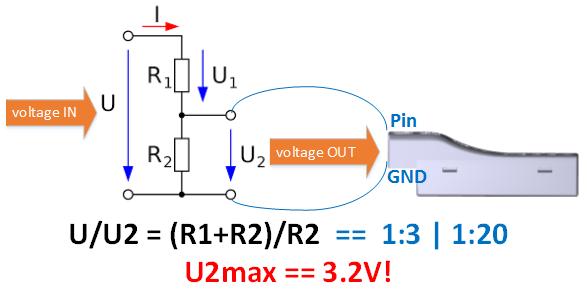 Since S32 must convert, you use a predetermined voltage divider 1: 3 or 1:20 if you want to measure higher voltages. Resistance values will, as usual, follow the E series with regard to their values. The actual total value initially does not matter but of course not below a few kiloOhms. Because the input impedance of the “measuring device” is in the megaOhm range: Who would go f0r 100 Ohms total resistance on 64V (P=U²/R=41W!)? Some caution is advised when handling voltages of up to 10 or 64V galvanically coupled to S32. Especially the keyword “ground loop” can play a destructive role here. Completely relaxed is that feasible if you have a CVS16: 16x 0..73V inputs, galvanically decoupled. Two of them can be depicted as “C1″ (CVS Pin1) and “C2″ (CVS Pin2). The difference to the other use of the 16 pins on CVS16 by S32 is the possible alarm thresholds on these single voltages.